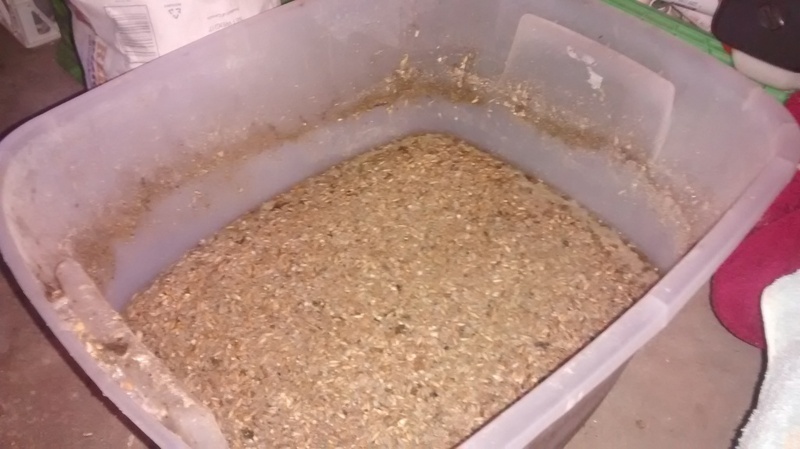 You may have read a previous post where we mention that in the spring we fermented our chicken feed. We stopped doing this over summer because wetness breeds fly problems. 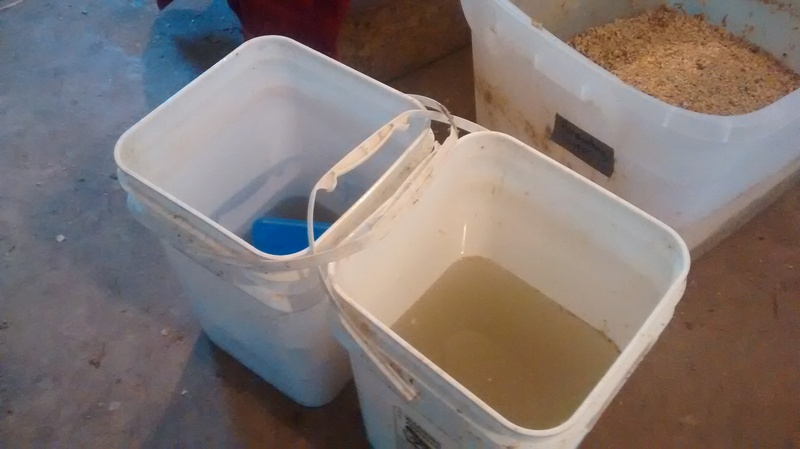 Around the end of August the fly population dropped and we began fermenting chicken feed again. Here’s a quick summary of why and how we do it. We soak/ferment the chicken feed for a few reasons. The strongest reason that we do it is because with this method the chickens waste zero feed. For those of you who feed chickens, you understand how rare that is! For those who don’t have chickens, chicken feed is a mix of all these different grains and supplements. If we feed the chickens this mix dry, they pick through it and eat the yummiest parts, and the rest they spill on the ground. When the feed is wet, all the different parts stick together more and the chickens can’t pick through it. This means they eat every last bit, and none is left. This was a happy byproduct of feeding wet feed that we discovered once we started feeding with this method. It wasn’t our motivation for starting to feed this way, but it’s been a strong reason we continue to do so. The reason we began feeding the chickens soaked, fermented feed is because it’s supposed to increase the nutritional value of the feed by making the nutrients more accessible. It’s the same idea behind people soaking grain or sprouting grain before cooking with it. 1. 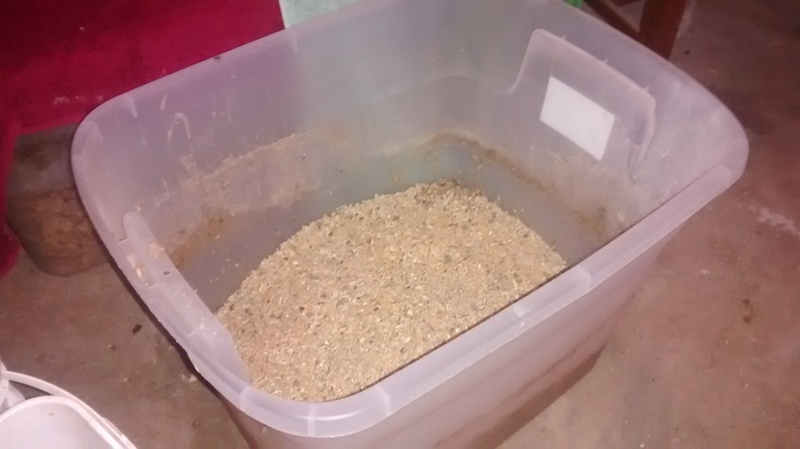 Scoop/pour a few days worth of feed into a large Rubbermaid bin. It’s important that you start with about 3 days worth of feed so there’s always feed in the bin. That way there’s a “starter” to help new material begin fermenting when you use feed and refill. Buckets of water to add to the feed. 3. Figuring the ratio of feed to water is a learned skill. Cover the bin with a towel to keep out flies, dogs, or whatever pests your garage may contain. Our dogs love chicken feed, but I’ve found a towel is enough to keep them out. It’s important that the mixture has airflow, so do not use an airtight lid. 5. Replace the amount of feed you took out from the Rubbermaid bin, and add more water with a splash of raw apple cider vinegar. Remember to add enough water that the mixture will still be a bit “watery” after feed absorbs water. That’s the entire process! When we have meat chickens going, we do a bin of laying feed and a bin of grower. The process is really simple, and we have found it’s worth it. The lack of feed spillage is worth it alone, considering what we pay for feed. If you have any questions about fermenting feed for your flock, post a comment or send us a message and we’d be happy to reply.